The beautiful designs of art deco office furniture range from elegant, smooth, streamlined French pieces made from exotic woods to American styles including a massive mahogany bootlegger's desk. The unique furniture style of the 1920s to the 1940s grew out of the Neoclassical and Art Nouveau movements. Originally the style was known as Modernistic or Art Modern. Coined in the 1960s, the term Art Deco quickly caught on to describe the furniture of those decades. The high prices of many Art Deco furniture pieces priced them far out of reach for most people. These pieces were individually designed by well-known American or French designers and created by highly skilled craftsmen. These exquisite Art Deco furniture pieces are highly sought after today and command top dollar. However, there were other designers of the times who chose to have their designs mass-produced, making them much more affordable for the average person to own. These mass-produced Art Deco furniture pieces typically have a more geometric look stressing their functionality. Like their high-ticket counterparts, these Art Deco furniture pieces are also highly desired today. Whether you are decorating an entire office in Art Deco style or want to add a unique stylish desk or bookshelf to your home, the Internet is an excellent resource for locating original Art Deco furniture, as well as high quality furniture in the Art Deco style. 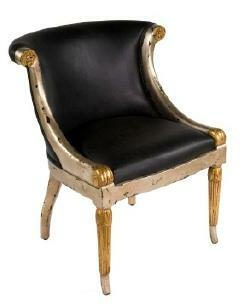 The following are several of the excellent websites specializing in Art Deco furniture. Among the many pieces of office furniture offered by the Art Deco Collection is a fabulous desk and chair in the style of Emile-Jacques Ruhlmann. Created by master craftsmen, the desk is a recreation of the famous piece by the well-known designer. A modernist desk from the 1930s made of flamed maple with Macassar ebony details. The piece features cubist elements combined with a sensual curved design. Birdseye maple combines with a wood and parchment inlay top to create a lovely six-drawer Art Deco desk in a stepped design. Beautiful intricate inlaid details complement the simplistic design of a 1930s French Art Deco desk made of Macassar ebony. A Maurice Jallot three-piece office suite, circa 1920s, includes a desk, chair and bookcase. Beautifully grained Macassar ebony veneers cover each piece. A rare Art Deco cubist desk and bookcase designed by Marcel Guillemard and signed Printemps was made circa 1910-1920s. A gorgeous modernistic office suite with applied patterned Macassar ebony veneers with inlaid mother of pearl accents was made in France in the 1960s. A Donald Deskey Art Deco bookcase desk combination, circa 1935, made of avoidire wood and trimmed in black lacquer. A stunning French Art Deco desk and chair constructed of palissandre and trimmed with bronze fittings and black lacquer from the 1930s. A stylish East Indian Laurel Secretary designed my Gilbert Rohde, with circular door pulls. Original and reproduction Art Deco office furniture is available in a wide selection of styles and price points.